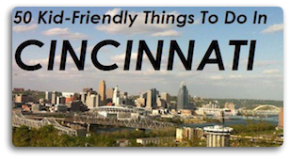 The Cincinnati Museum Center has a special exhibit right now that has been here for several months, A Day in Pompeii. Our family has been wanting to go for quite a while, but just made it this past weekend. The exhibit will only be showing until August 12th, so if you are planning to see it you had better go soon! The reason we waited was because I wanted my children to learn more about Pompeii before we went to the exhibit. My older two kids both read Mary Pope Osborne’s Vacation Under the Volcano (Magic Tree House #13) and then we went to the Covington library to get non-fiction books about Pompeii from the children’s section. They spent quite a bit of time poring over these books and having discussions about what life must have been like in Pompeii. Between the books, the discussions, and then actually going to the exhibit I feel like it was a perfect comprehensive history lesson for them. As I said, we were all very excited to go to this exhibit. When we left I asked the kids if it was as cool as they thought it was going to be, and without hesitation both Ella and Max said simultaneously that it was much cooler than they thought it would be. I agreed. I had expected artifacts gleaming in glass cases and plaques describing what we were seeing. What I didn’t expect was the detailed audio tour (bonus, they have an adult’s version and a “family friendly” version of the audio tour), the hands-on interactive activities for the children, the interesting informational videos, and the fact that you could get up close and personal (without touching of course) with the items on display. The whole exhibit is amazing, you get such a realistic view of what life was like in Pompeii until it was destroyed. The kids loved the interactive learning room at the end of the tour. There were plenty of hands-on activities for them, including the chance to touch a REAL lava rock, which they thought was cool. And of course the enjoyed the gift shop too, which had plenty of books about Pompeii and volcanos, as well as mementos of all sizes/prices. A Day in Pompeii is a collection of more than 250 priceless ancient artifacts from the Roman city of Pompeii and its surrounding areas. In A.D. 79, Pompeii was frozen in time by the catastrophic eruption of Mt. Vesuvius, burying everything in its path for more than 1,700 years. The same ash and debris from Vesuvius’s unpredicted eruption that destroyed the city, is also the same thing that preserved it. A Day in Pompeii brings room-sized frescos, marble and bronze sculptures, jewelry, gold coins, and body casts of the volcano’s victims to Cincinnati Museum Center’s 15,000-square-foot exhibition hall. Pompeii’s archeological treasures rarely leave Italy, and this national touring exhibit marks the first time that these rare treasures will come to the region. Don’t miss this moving glimpse through a unique window on the ancient past. When we made plans to go to “A Day in Pompeii” I will admit, I was concerned about whether it was going to be appropriate for my kids, and whether they would be able to handle it. And it is indeed a very intense exhibit, especially the room filled with resin casts of bodies that were trapped under the ash. But my children were well-prepared by all of the books we read and chats that occurred before we went. They were somber and curious in the room filled with casts, and talked openly about what must have been going on that day. An employee of the Museum Center told me to reassure the children that not everyone who lived in Pompeii died that day. Apparently 90% of the population had escaped the city. The exhibit did not cause nightmares or tears, rather gave them a unique view of ancient history. 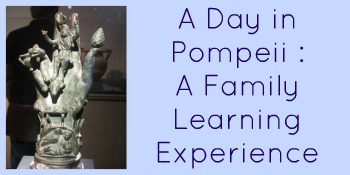 I have always been fascinated by the history of Pompeii, and this exhibit fueled my interest. I came home and added movies about Pompeii to our Netflix queue and read through some more history of the doomed city. So it wasn’t just a history lesson for the children, but for my husband and I as well.